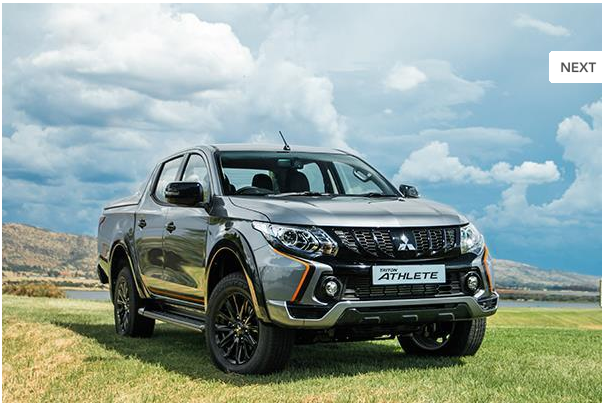 Mitsubishi South Africa has just launched a striking new Triton “Athlete” Special Edition, which is based on Mitsubishi’s award-winning Triton double-cab 4×4 automatic derivative. It is assembled in Mitsubishi’s Thailand factory and fully imported to South Africa, and becomes the flagship model of the double-cab range. According to Mitsubishi, the new Triton Athlete is aimed at those who live life to the extreme, participating in activities such as surfing, mountain biking, paragliding, show jumping and even motocross or off-road motorcycling. The new Triton Athlete is available in two colours; white and grey, and is distinguished by its orange and black exterior, and interior design cues that further enhance the sporty design. Unique to the Athlete model is its bold and eye-catching orange highlights and black mouldings which include a new front bumper garnish, new black grille with honeycomb mesh and new front and rear black bumpers and wheel arches, as well as 4×4 Super Select II stickers highlighting its unique four-wheel drive system. The new Triton Athlete model runs on new black powder-coated diamond-cut 17″ alloy wheels, and has a stylish sports bar and an integrated tailgate spoiler, dark-grey and orange decals with black highlights on the side steps, door mirrors, door handles, rear bumper and a new tailgate. A Tonneau cover or armadillo load box covers, plus a range of manufacturer’s approved accessories are available from dealers. On the inside, the Triton Athlete has two-tone black leather seats with orange inserts and “Athlete” embroidery matching the orange stitching found on the black leather seats, steering wheel, gear lever, door panels and the center console. The Triton Athlete is based on the International Triton Adventure X-Development, which includes Bi-xenon HID headlamps, daytime running lights, multifunction steering wheel, shift paddles for the 5-speed automatic transmission, an upgraded instrument display, a smart-key system with engine starter button and automatic dual-zone air-conditioning. The new Mitsubishi Triton “Athlete” is powered by a class-leading 2.4-litre turbo-diesel engine producing 133 kW at 3 500 r/min and peak torque of 430 Nm at 2 500 r/min, with drive to the wheels through Mitsubishi’s excellent five-speed automatic transmission. The power-plant will propel the Triton “ATHLETE” from 0 to 100 km/h in just under 12 seconds and to a top speed of around 180 km/h. It shows impressive performance on the highways, off-road adventure, urban agility and has a towing capacity of up to 3.1 tons, making it able to tow heavy trailers, boats, horseboxes etc. Information from Mitsubishi, shows that the Triton “Athlete” has excellent axle reticulation, their proven Super-Select II four-wheel drive system and class-leading approach angle of 28°, departure angle of 22° and break-over angle of 25° make it a mean off-road competitor especially for those who participate in extreme adventure activities. The Triton Athlete is as nimble as an obstacle course athlete, thanks to its manageable size, which makes it easy to drive around town, great to manoeuvre in tight spots, on and off the road, and will easily fit in most garages and parking bays. Safety features, both active and passive, are quite comprehensive and include seven airbags (Dual Front Airbags, Side Airbags, Driver’s Knee Airbag and Curtain Airbag), and the Isofix child seat anchor system for increased safety for babies and toddlers. Also standard are disc brakes with ABS and EBD, Brake Assist, Active Stability and Traction Control, Hill-start Assist, and the Super Select 4WD-II 4WD system. The Mitsubishi Triton Athlete is already available from all Mitsubishi dealers in Southern Africa at a special launch price of R559 995, which is the same as the listed retail price of the standard Triton 4×4 Double-Cab Automatic. It comes standard with a 3-year / 100 000 km manufacturer’s warranty and a 5-year / 90 000 km service plan with service intervals at every 10 000 km’s. In conclusion, if you are on the market for a decent well equipped double cab bakkie at a decent price, the Mitsubishi Triton Athlete should be a “must” on your shopping list.